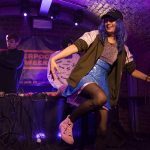 Kero Kero Bonito breezed into town for Liverpool Music Week and Getintothis’ Daniel Bundy saw one of the best parties around. 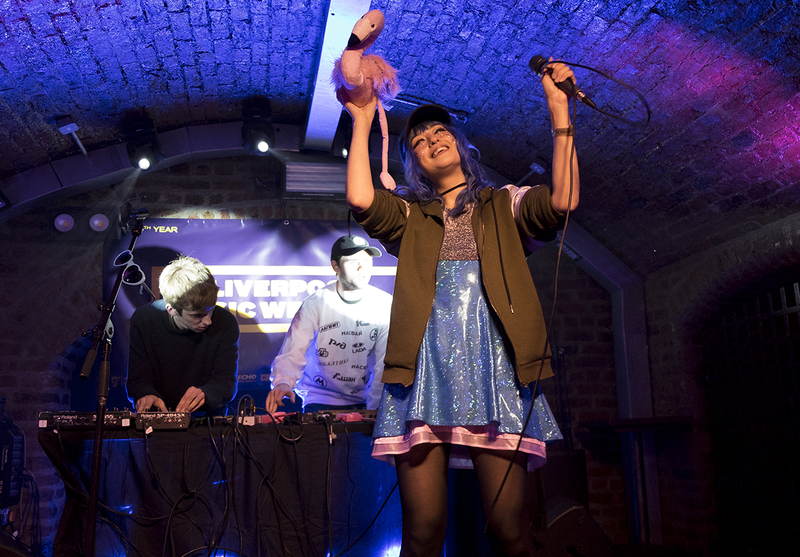 It was hard to know what to expect from Kero Kero Bonito. 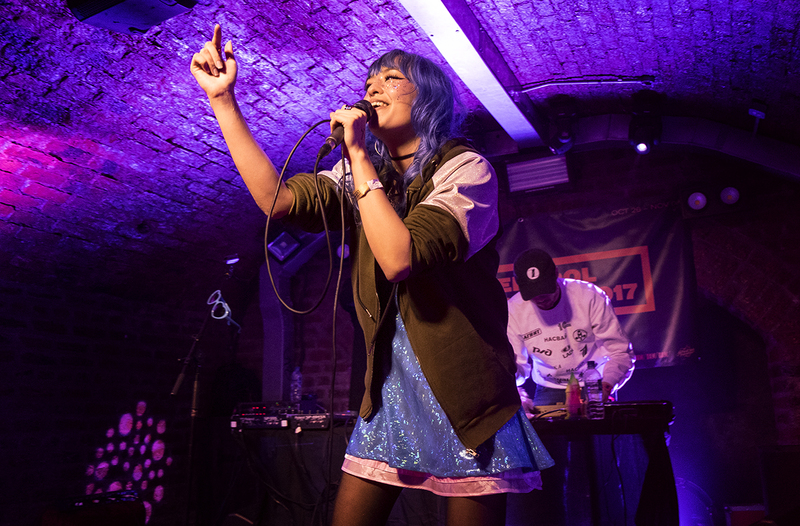 The London three piece have a unique sound, drawing from vastly contrasted influences including hip hop, J-Pop, video game soundtracks and, of course a barrage of samples. What crowd would such a mix draw? How would it translate to a live experience? As it happens, pretty well. 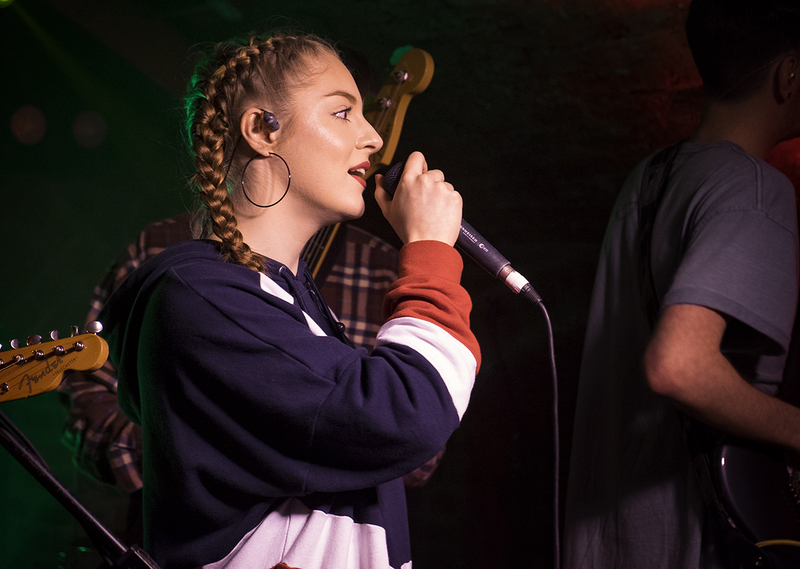 A broad variety of faces turned up to pack out the basement and shake the walls with cheering. 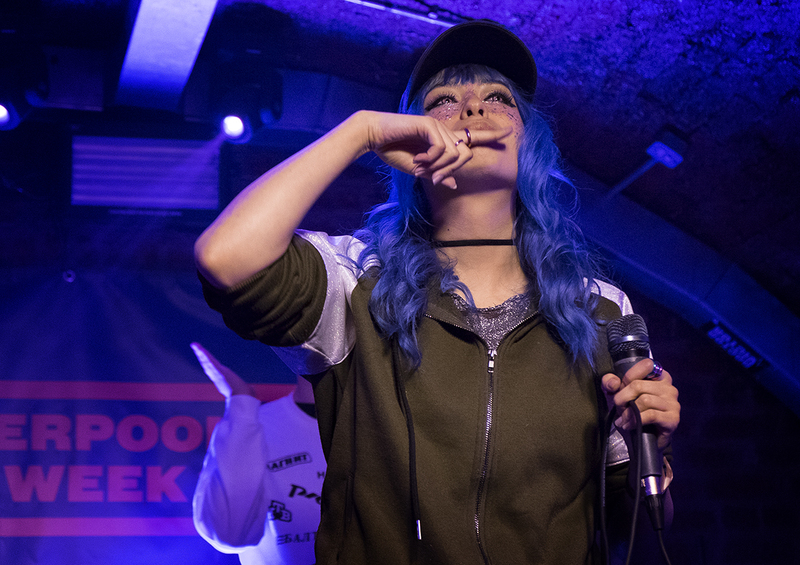 Blue haired, glittery, with bright eyes and a natural sweetness in her stage presence, Kero Kero Bonito‘s Sarah Midori Perry channels the aesthetic of the J-Pop idol in their music, a child-like excitement for parties and life. Yet they’re not afraid to descend into pure noise either and crush the walls with bass either. 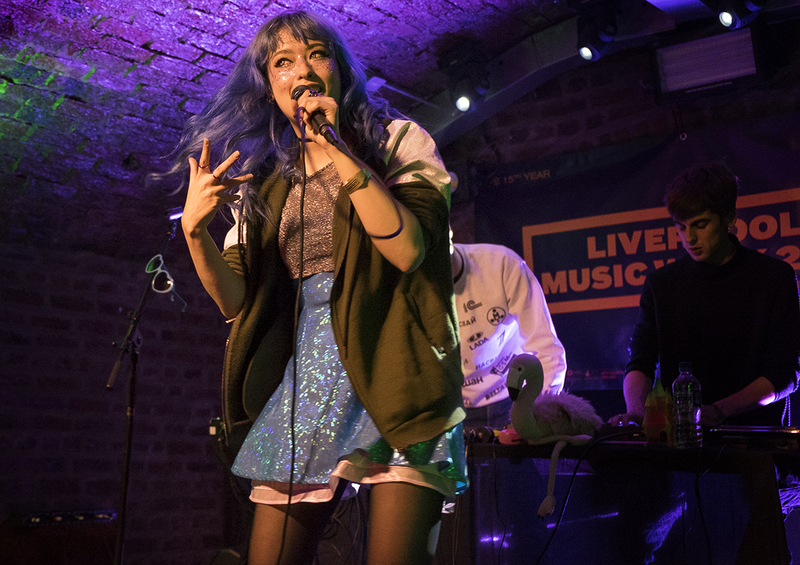 Her band behind her weren’t exactly cut from the J-Pop aesthetic, but they matched her enthusiasm as they played. With Sarah marching around, commanding the crowd to jump, brandishing toy dinosaurs and flamingos who were as much stars as the performers themselves over her head, it’s definitely a unique sound but the audience were well and truly catered to. They responded with cheers that would put a metal gig to shame. 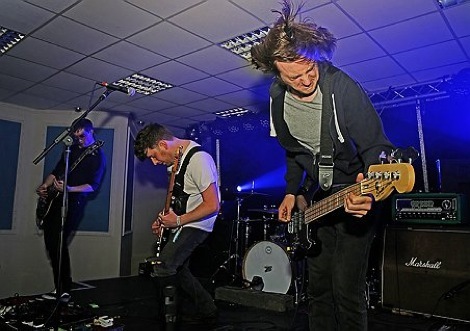 When you play a niche sound, you risk taking a collective of true loyalists over mass appeal. 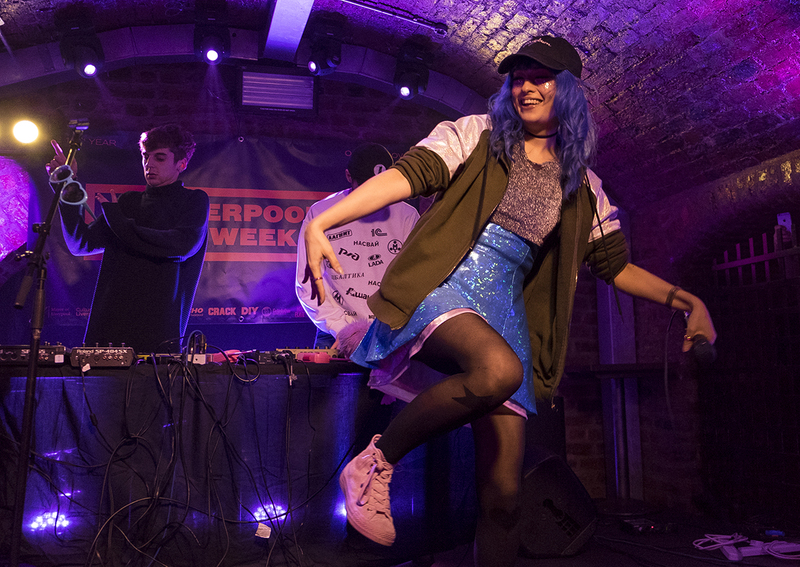 Kero Kero Bonito didn’t come alone though. 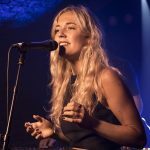 Three support acts helped set the tone for the evening including Wildfires, a pop-rock five piece. 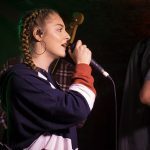 Being the first band on can be a rough one and with E.B.G.B.’s being quite an intimate venue, the stage space was a little crammed in with the numbers, making for difficulty in getting the level right. A remarkably powerful voice fought to be heard over her instruments, breaking out on some crisp high notes. Yet in spite of this, the overall quality of their music was high and were great to hear without the hiccups. They’d be even better with the levels right. Then, after a brief back and forth between vocalist and sound tech, appropriate levels were achieved and it was onto Luna. 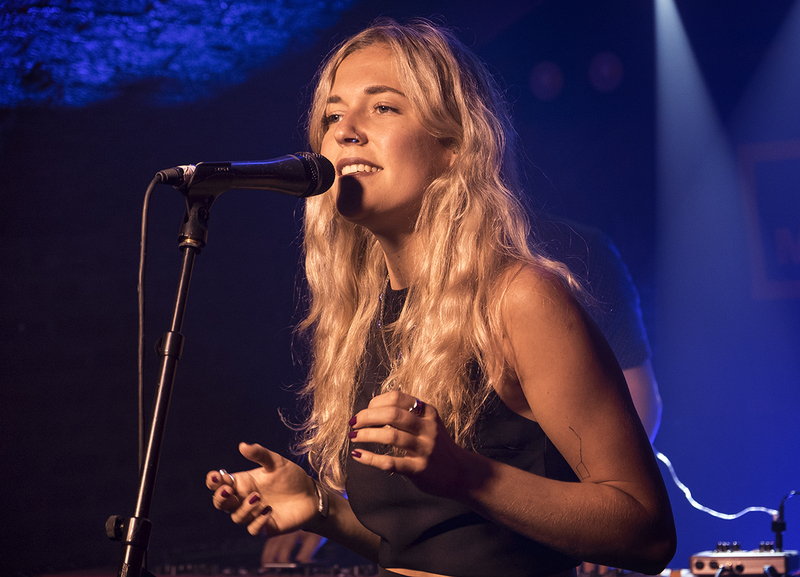 Slow, electro-pop with backing from an electronic drumkit and synth, this is ethereal pop for when you’re restless at night and not quite ready to sleep. It’s trippy. It’s glitchy. 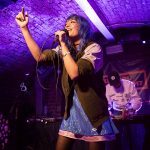 It’s unsettling, a touch retro-80’s and while the pace was slow compared to the bands ahead, Luna‘s a talented electro pop performer. Their sound is unique, uncomfortable, yet thoroughly enjoyable. Pizza Girl followed up next. 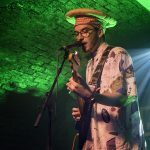 A one-man band with a colourful shirt, pizza hat and a wonderfully eerie voice, he built the excitement levels up with mountains of enthusiasm. 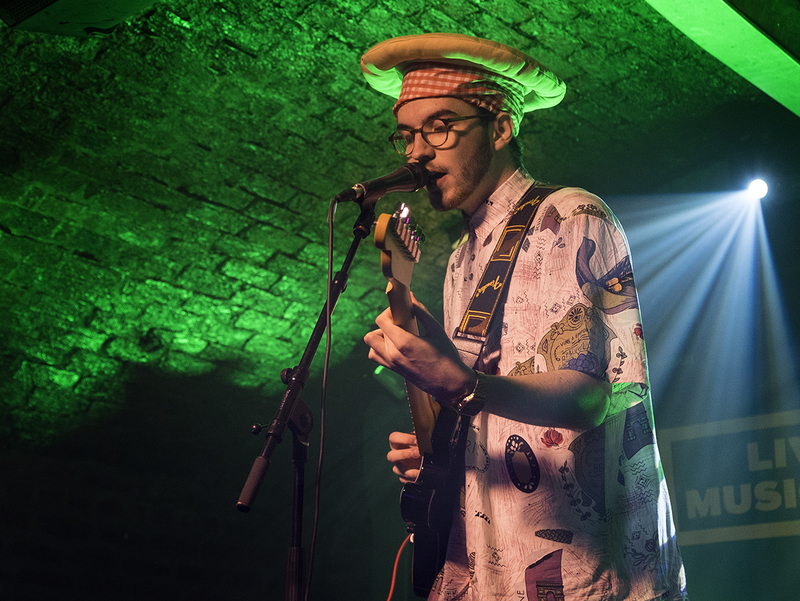 With a Mac for backing tracks of distorted electronica, Pizza Girl accompanies himself on guitar and has a vacant and haunting quality to his voice. All four bands tonight, some more esoteric than others, all earned new fans of their own through their nuanced and well- crafted sounds. 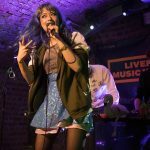 The supports would be worth seeing on their own merits and no doubt Kero Kero Bonito will continue to win more and more fans over with their light-hearted fun.